This Too Many Bones review was made after playing the game seven times. What is Too Many Bones? Too Many Bones is a cooperative strategy game in which you develop your characters with a unique dice-building mechanic and, hopefully, defeat the final boss. It was designed by Adam Carlson and Josh J. Carlson and is published by Chip Theory Games. To begin a game of Too Many Bones, everyone will choose a Gearloc and then decide which tyrant to face. Each tyrant has specific types of “baddies” that you’ll be taking on until you finally face the tyrant himself. 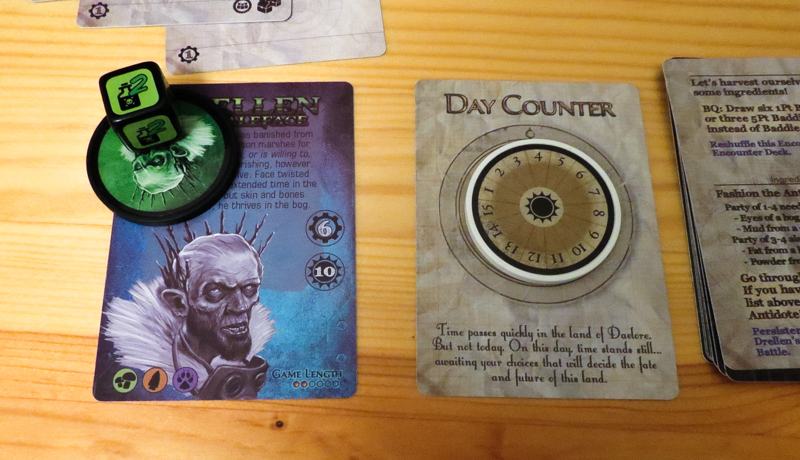 You’ll set up the stacks of baddie chips, then you’ll add the tyrant’s encounter card(s) to the encounter deck. The game is played over a number of days/rounds. Each day you’ll draw an encounter card and choose one of the options listed. Each option lists the tasks that you’ll need to complete and any rewards and progress points that you’ll receive for completing the encounter. Throughout the game, you’ll be building up your Gearlocs. You’ll gain training points by successfully completing encounters, allowing you to get better stats and skills. For example, if you complete an encounter that gives you two training points, you could increase your attack stat and gain a skill die that could help you later on. Each Gearloc plays quite differently than all the rest. Boomer builds bombs that can take out multiple enemies; Tantrum is an angry little guy who does more damage the longer he stays in battle (Rage!!! ); Patches is fantastic at healing everyone; and Picket is a pretty balanced character who uses his shield for both defense and offense. 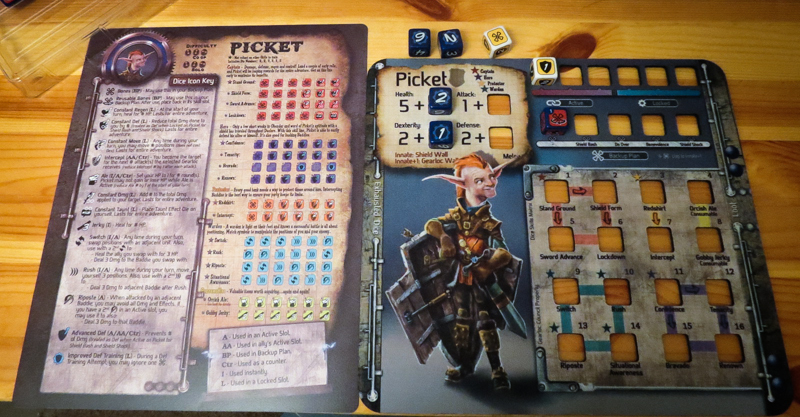 The game includes reference sheets that will tell you how each Gearloc’s 16 dice work plus some tips on how to build your Gearloc. Most of your time will be spent on the battle mat. This is where you get to use those skills you’ve built up so you can take out some enemies. The mat is a 4×4 grid that can fit up to four enemies at a time and any Gearlocs in the game. The Gearlocs will start on one of the two front rows (melee and ranged spots) and the enemies will start out in the back two rows. Turn order is determined by rolling the Gearlocs’ initiative dice and putting the enemies in order based on their initiative stats. During battles the enemies will use attack dice and their own special abilities to attempt to defeat the Gearlocs. Players will first target enemies, then they’ll check their Gearlocs’ dexterity stat to see how many dice they can roll (attack, defense, and/or skill dice), and then they’ll resolve those dice. Again, all of the skills in the game are listed on the reference sheets. The bones found on most of the dice represent misses, but you can place those dice on your Backup Plan. The Backup Plan gives you even more unique special abilities that you can execute by spending the bones. If you’re ever able to fill all of your Backup Plan’s slots, you can upgrade your default “Innate” ability to a more powerful Innate +1 ability. You’ll also find Active and Locked slots on your mat, which give you ways to save certain dice, including defense dice and skills. You can even place some dice on other Gearlocs’ Active slots to help them out. If you defeat all of the baddies on the mat, you’ll get the rewards listed on the encounter card. These rewards could be training points or Loot cards. You’ll get the basic loot immediately, but you’ll have to make lockpicking attempts on the Trove Loot, which are permanent benefits that you’ll use for the rest of the game. Lockpicking, which is a simple dice-rolling/number-matching mini-game, is something you can do at the end of a day in an attempt to reveal that Trove Loot. If you’re able to gain the amount of progress points listed on the tyrant’s card, you can decide as a group to face the final boss instead of revealing a new encounter card. As long as you don’t run out of time (this number is also listed on the tyrant’s card), you can keep attempting to defeat the tyrant. If you do defeat him, everyone wins. You’ll lose if you run out of time. It’s amazing watching these characters develop over the course of a game. In one game I had Boomer and she was SO weak in battles at first, but slowly she became the group’s MVP as she built up her bombs. What’s great is that you really can feel/see that happening as you move from encounter to encounter and train your characters. The component quality is ridiculous. 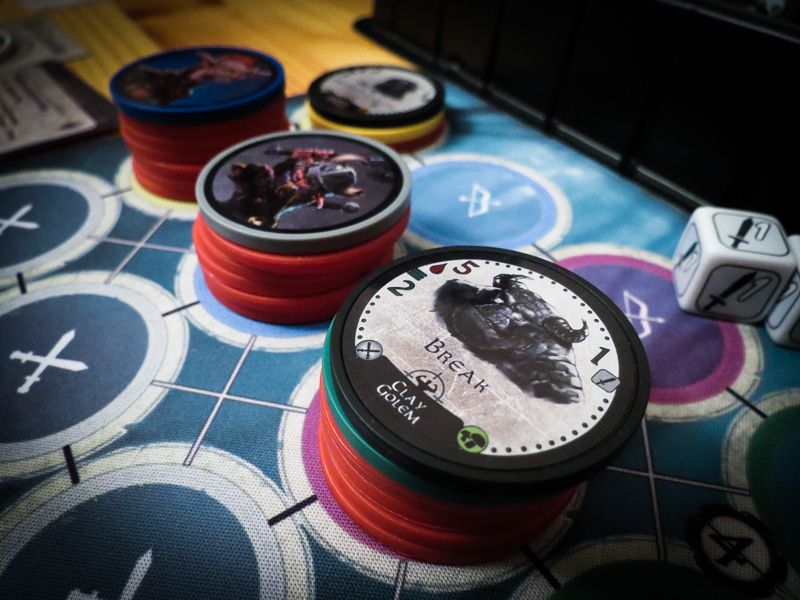 Love the dice, love the poker chips, love the mats, love the cards, love the reference sheets… lots of loves. I think a lot of people will assume that this is a complex game, but it’s really not. Sure, it takes a little time to get used to the different Gearlocs, but you can definitely learn as you go. The encounter cards tell you how to set up the battles and what rewards you’ll get, and the reference mats will help you with just about everything else. Even if you only get the core game with none of the additional Gearlocs, there is plenty of replay value here. 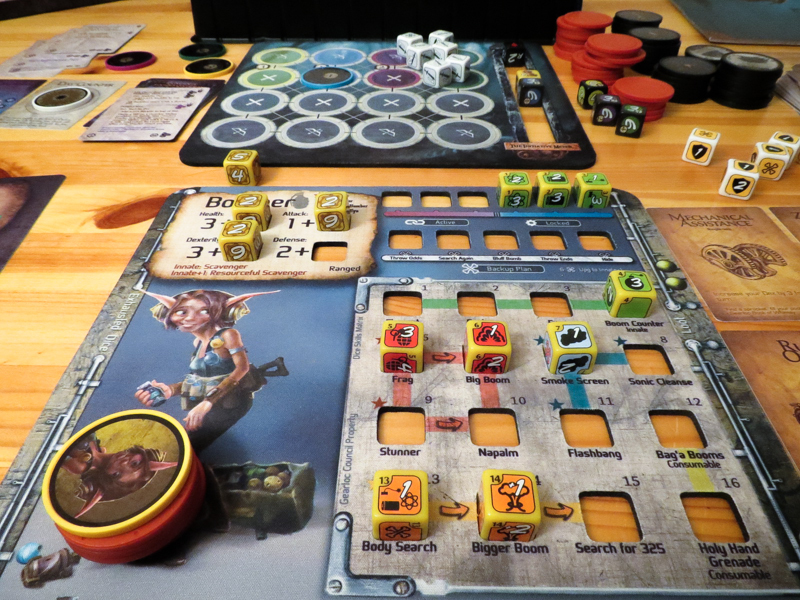 I’m seven games in (plus a few solo games to get my feet wet) and I’m not even close to knowing the best way to build each Gearloc. I’ve never played Hoplomachus (also from Chip Theory Games), so this was my first experience with poker chips used as health trackers. Oh man, I want more games to use these! There’s something oddly satisfying about sliding the health chips out from under the enemies as you beat them down. This game is very challenging. Even the easiest difficulty level, Greenhorn Adventurer, is pretty tough regardless of the tyrant. But that’s actually a good thing in this case since it never feels impossible and it actually helps you learn how to approach battles and how to build your Gearlocs. Too Many Bones also has an excellent solo mode with a dedicated encounter deck. I’m not a big solo gamer, but I’d definitely play this one solo again. It can be pretty frustrating setting up a battle and then having to quickly take it all down after losing in the first round. This happened a lot in our first couple of games, but it hasn’t been as big of an issue since then. While there definitely is cooperation in this game, I think they could have added in more ways for the Gearlocs to interact with each other. Someone in my group said he wished each Gearloc had one or two dice that could combo with one or two dice from each other Gearloc. That would be awesome. Even though it will take a while to master the four Gearlocs that come in the box, I think six would have worked a bit better. That way four-player groups wouldn’t always have to use the same four Gearlocs. Quarterbacking can be an issue. Everything’s out in the open, so it’s pretty easy for people to (attempt to) take over and tell others what to do, especially during battles. Too Many Bones is a fantastic game. My group has played a bunch of the top-rated games in the last couple of months and TMB has probably been the best of the bunch. The original theme, the challenge even at the lowest difficulty levels, the simple-yet-superfun battle system, the Gearlocs themselves, the component quality… seriously, there’s a lot to like. I don’t think Too Many Bones is for everyone, though. Some people don’t want to have to spend multiple sessions learning how to build and play with a character… and then go through that process again with another character. Some people don’t like tough co-ops, which this definitely is. Some don’t want to have to spend $100 or more on any game, which is understandable. If you fall into any of these categories, you probably should pass on this one. To everyone else, I highly recommend Too Many Bones. I’m 99 percent sure that this one will end up in my group’s top 20 co-op games, maybe even in the top 10. I really can’t wait to test out the other characters they’ve put out as add-ons/expansions. Update: Too Many Bones is now high up on our top 40 cooperative games list. 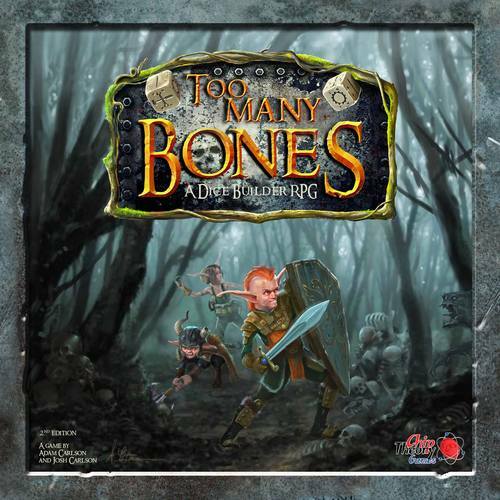 Thanks for taking the time to read our Too Many Bones review! To stay updated on all things cooperative board games, follow us on Twitter, Facebook, or via RSS.